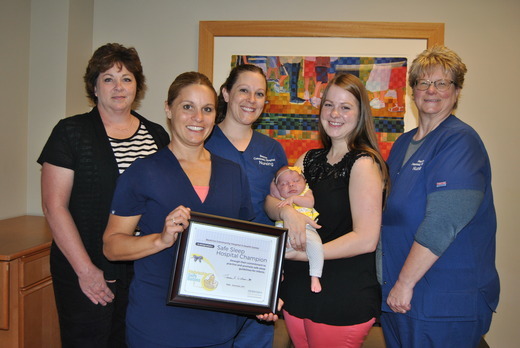 Jackie Moline, Maternal/Infant Health Program Coordinator for the Nebraska Department of Health and Human Services, presented the Beatrice Community Hospital Labor & Delivery and Nursery Departments their certificate for earning “Safe Sleep Champion” designation. Pictured, from left: Jackie Moline, Jill Allen, Angela Ahlman, Angie Blecha and Laurel Stanosheck. Beatrice Community Hospital and Health Center is pleased to announce it has earned “Safe Sleep Champion” designation from the Nebraska Department of Health and Human Services, as part of an initiative to reduce infant deaths in Nebraska. Sudden infant death syndrome (SIDS) and other sleep-related deaths are the leading cause of death in babies in their first year. In 1992, the American Academy of Pediatrics identified that allowing infants to sleep on their stomach was a major risk factor for SIDS, and a major campaign called “Back to Sleep” was launched in 1994 to increase public awareness about having babies sleep on their backs. That change resulted in a 50 percent decrease in sudden infant deaths across the United States. Yet, nearly 25 years later, SIDS remains the leading cause of death in infants between one month and one year of age. And, in Nebraska, infant deaths are slowly on the rise, according to the Nebraska DHHS. In 2015, 26 babies were listed as Sudden Unexplained Infant Deaths (SUID), up from 22 SUID deaths in 2012. Almost all of these are believed to have been preventable. In response to the increase in infant deaths in Nebraska, the Nebraska DHHS worked with the Nebraska Hospital Association, the Nebraska Chapter of the American Academy of Pediatrics and the Nebraska Perinatal Quality Improvement Collaborative to launch the Nebraska Safe Sleep Hospital Campaign. The Safe Sleep Campaign starts within the hospital setting, encouraging all Nebraska birthing hospitals to become a Safe Sleep Hospital Champion. To be considered a Safe Sleep Champion, the hospital signs a pledge, creates or updates a Safe Sleep policy, provides yearly education to hospital personnel, models safe sleep recommendations, and educates parents with evidence-based safe sleep materials. There are currently 34 Safe Sleep Champions in the state, and 13 other hospitals have pledged and are working through the process to become a safe sleep hospital. More than 200 babies are born annually at Beatrice Community Hospital. A – Your baby should always sleep Alone. B – Your baby should always sleep on his or her Back. C – Your baby should always sleep in a safe Crib.